Heidi: Where did you get all that candy? 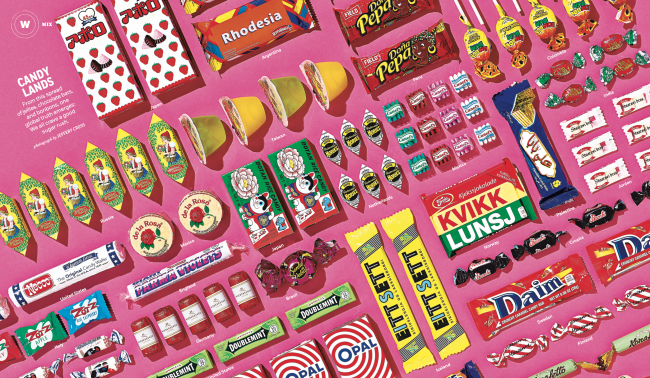 Jeffery: AFAR’s art department collected iconic and oddball candy (from staff members who had traveled recently, from online sources, and from local shops), based on visually interesting packaging, as well as geographic range. The Mix department runs in the magazine in every issue, and always tackles one object, from all around the world. The candy came from Sweden, Germany, Mexico, Russia, Japan, Colombia, Iceland, and beyond. What is your process for setting up those graphic shots? 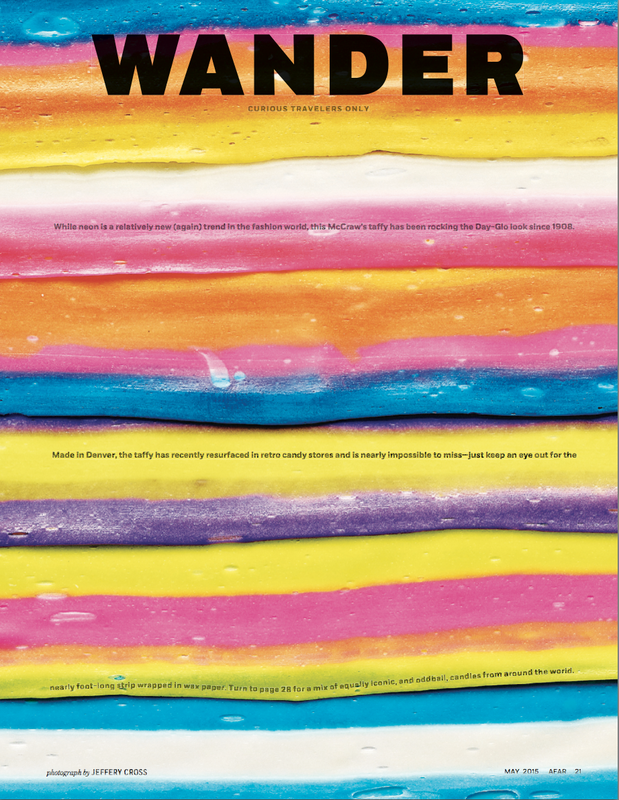 AFAR’s art director Jason Seldon mocked up the candy in the San Francisco office before we shot it in my Oakland studio. The products were all bright, colorful, and pop-y, and Jason wanted to play up that aspect. He’d also wanted to use that crazy pink background for some time, and this seemed like a good opportunity to do so. First step was to level the set and camera, waned the shot to be as rectilinear as possible. To help with the arduous task of getting the candy lined up in some sort of grid two we employed two special pieces of equipment: the first being a laser square…always fun to play with lasers, and the second being a 24” x 36” vacuum easel, this gave us a totally flat surface and held each piece of candy in place…magic!..The only downside was the noise. A vacuum easel should come with a great stereo… or noise canceling headphones. How many options did you have and how long did it take to set up that spread? For this spread we took the slow and steady approach to end up with one version built piece by piece, evaluate then modified until it looks finished. According to the metadata the shoot took aprox 4hrs from start to finish. Did you try any of the candy? We did! Unfortunately… I tried almost all the candy. It was all good in its own way. It was cool to see how each country approaches its sweets, all super different than our candy here in the states. Lucky for me that there were two families with children on my loading dock after the shoot… Being the stranger with the candy I doled out as much of the candy as they would take. The kids went crazy over the McCraw’s Taffy… its crazy big. How big was that piece of candy for the opener?